Hooiberg, Aruba’s second highest mountain, seen from the Casibari Rock Formations. Did you know that Aruba has two mountains? They’re named Hooiberg and Jamanota. Mount Hooiberg is a volcanic mountain that looks like a haystack, hence its name (“hooiberg” is Dutch for “haystack”). 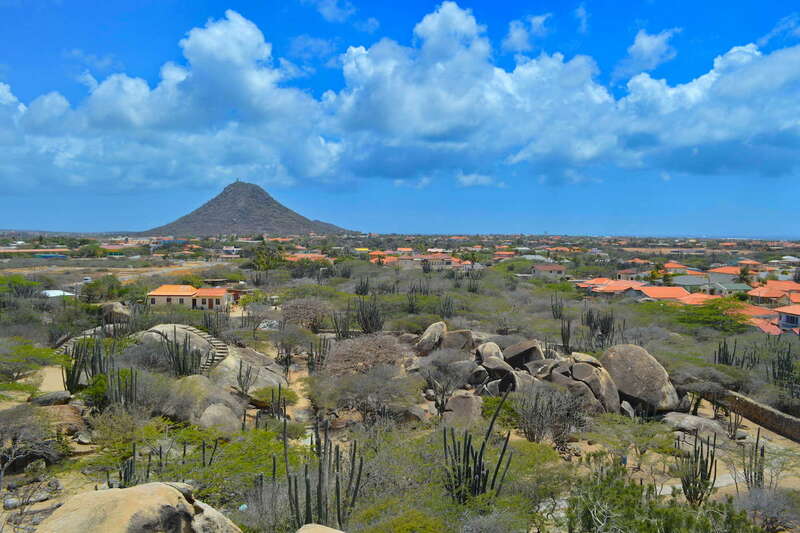 The hill is located in the center of Aruba, just about 2 kilometers north-east of Oranjestad, the capital of Aruba. It’s about 530 meters wide, and its height is about 165 meters, which make Hooiberg the second highest mountain in Aruba. Mount Hooiberg is only a bit shorter than Mount Jamanota, which is located in the Arikok National Park. Jamanota is the highest point on the island, with a height of 188 meters (617 ft). If you feel like doing some exercise, climbing mt. Hooiberg is a great opportunity to get a little active during your stay on the island. Burning some calories is always a good idea, after all, those calories quickly add up, especially when you’re on vacation! At the same time, it’s one of those things to do in Aruba that is absolutely free for everyone. If you’re searching for a nice place for some uphill jogging, Mount Hooiberg is a great spot for an early morning cardio workout as well. Just do it! You’ll probably spot a few locals or local sports teams using the mountain to build endurance, running up and down the concrete steps multiple times. Getting to the summit of the “haystack” requires you to climb stairs along a pathway with about 600 concrete steps in total. Reaching the peak will take you anywhere between 10 to 20 minutes, depending on your physical condition. Along the way, there are a few spots where you can catch your breath, rest up a bit and stretch your legs. Note that there are railings only part of the ascent, so take it slow and be careful, especially when you’re going up there with kids. The best time to climb Hooiberg is either early in the morning, or at the end of the afternoon, after 5 PM when the sun goes down. You’re free to choose any time you want of course, but once the Aruban sun is at its highest point in the sky and temperatures are highest, conquering Mt. Hooiberg will be a far more significant challenge. Go early enough, at around 6 AM, and early birds will get a pretty sunrise as a bonus. Sunsets around 7 PM are phenomenal here too. Whichever time you choose to go up the mountain, make sure you bring plenty of water because you’ll rapidly work up a sweat in Aruba’s hot and humid weather. There are no facilities on the summit. Also, make sure you’re wearing comfortable shoes, your ankles and calves will thank you the next morning. Leave your flip-flops at the hotel, because the steps can get steep, and the rocks on the pathway can be quite sharp. If you have one, you’ll want to be wearing your Fitbit or Apple Watch if you have one of those. 600 steps equal about 40 flights give or take – an accomplishment you’ll want to have in your activity logs for sure! If you choose to climb Hooiberg Mountain at the end of the day, perhaps you’ll want to bring a thin sweater as well. On the way up, the trade winds will keep you cool, but the breeze can cool you down a bit too much on the way down. If the weather gods decide to throw one of those quick seasonal downpours on you, don’t worry, you’ll dry up in no time. Before you go up, see if there are any mosquitos, they could be out there when there’s no wind. If that’s the case, you’ll want to spray some repellent on before you start climbing up the steps. Getting to Hooiberg by car will take about 20 minutes. From the Palm Beach area, just head east on Rte 3. At Kudawecha, Rte 3 will bend south in the direction of the Casibari Rock Formations. Once you’re there, continue on Rte 4. After you spot a Burger King on your right, take the fourth street right. Immediately after you pass Dennis Bar & Restaurant, turn left. Make another left turn, then another right turn. The street you’re now on is called Hooiberg. Go straight for another 400 meters or so, and you should be there. There is a parking lot at the foot of the stairs with easy access. If you don’t have a car, be sure you ask the taxi driver also to come back and pick you up.